US Hawks Hang Gliding Association • View topic - ANAPRA, NM along the Mexico fence. ANAPRA, NM along the Mexico fence. SUNDAY, AUGUST 14th: Bill and I met Taro Nihonyanagi about 10:45 in El Paso, and soon were at the base of the Anapra site. Lo and behold, the only other vehicle we spotted was a blue Corolla, driven by our up-and-coming PG pilot Steve Crye. He guided us up to the launch, helped us to set up, and fed us the vitally important wind speed data we needed. The gusts got as high as 35 mph, the lulls down as low as 13. (Steve had already had a bumpy sled ride from the site in his PG, and was heading home when he met us.) We set up our Wills Wing gliders: My U2, Bill's Sport 2, and the Falcon 195 for Taro. Eventually, only the U2 was still assembled; the winds looked to strong to Taro and Bill. I finally launched into 23 mph east winds at 2:20 pm, MDT. I turned right, but not soon enough; I was right out of the lift band, as I cruised along the ridge to the Border Wall. I turned there, and without enough altitude for another pass, I just went out to the landing area. I had an excellent landing. Bill, Taro and Steve soon joined me, as I put away the glider, and so did a nice Border Patrol agent, who had a great time learning about PG's and HG's from us. We said goodbye to Taro about 3:30 and he drove back to his home in El Paso; Bill and I reached Las Cruces about 4:15. It was a pleasant day with good friends, and a fun flight even if short. Who am I to complain? The quoted post above was posted by Robin on the flying possibilities topic and I thought I'd start an Anapra topic to post the YouTube video and still pictures. Re: ANAPRA, NM along the Mexico fence. Just yesterday or the day before (?) YouTube made some changes without notifying me. Bob had to change some code in order for us to post videos as usual. Now and just by accident I noticed that the toolbar on the bottom of the YouTube video now works. able to make the video go to full screen and change the resolution setting and even select slow motion. Below is a "Snipping Tool," screen capture where it will not work but on the actual video it does work. Click on the picture below to expand it to see the Now Working tools indicated by the red arrows. If you don't fly south over the border fence into Mexico the usable ridge is 0.38 of a mile long. If the forecast holds Robin is going to throw me off of Anapra tomorrow. Yeah, I noticed that i can now expand the Youtube video to full screen in the forum. Very good! Frank Colver wrote: Yeah, I noticed that i can now expand the Youtube video to full screen in the forum. Very good! Super job on the editing of that video!!! When Robin and I stopped behind launch at Anapra Ridge (Mesa) at 12:08 today it was too light to soar. A Harrier Hawk was climbing and drifting to the NW out in front of launch. We decided to wait until 1 pm and got back into the Xterra to listen to NPR which put Robin to sleep. The forecast had the wind scheduled to pick up between noon and two pm. At 12:22 a big thermal cycle came through (I thought) but it was more like someone hit the switch and started the blow out. 25 mph with gusts to 35 mph. The above chart shows history at El Paso International Airport (KELP) 11 miles out in front of Anapra to the east. The Deming history is what is happening 70 miles downwind to the WNW. Re: ANAPRA, NM 10-21-2016 Friday. Robin and I are headed for Anapra since a grader was busy on our local tow road (&^%$#@*). We should be down there at 1:00pm. 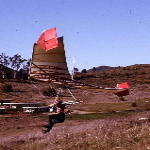 Bill Cummings wrote: Robin and I are headed for Anapra since a grader was busy on our local tow road (&^%$#@*). Well, plan B didn't work out for us. Once we arrived at Anapra except for thermals it was too light and cross. Our tow road north of I-10 (Interstate 10 NM) at exit 116 is west of Las Cruces by 24 miles. We had along my 1,600' towline for static ground based towing. need 23 mph tops with the 5 mph wind we had out of the ESE. Seldom is the wind down the road like it was today but just in case it was cross wind I had brought along a two foot length of one inch pipe to pound half way into the ground straight up wind. The plan for that would be to take off straight into the wind toward the pipe/stake then the towline would lift over the pipe as the glider gained altitude and then we would crab down the road in a crosswind. Even coming with a few trick up our sleeve to get airborne we didn't have a trick for getting around the grader. Juan Mira, a student at University of the Southwest in Hobbs, got a flight at Anapra today. The winds were strong, out of the east/southeast. Nick Reiter was on the left wing and I was on the nose wires of Juan's Vision Mark 4 Seventeen, when he took off at 10:10 am MST. Steve Crye took some video, as well. Juan yelled "Clear! ", I hit the dirt, and I heard a scrape from the right wingtip as he charged forward. Fortunately, he kept on going, and rose up easily into a soaring flight. He was 50 feet or more above the mesa as he came back from his first pass. He made several passes, ridge soaring this 200-ft hill, zooming off to the left and coming slowly back to the right - though the winds at launch were pretty much coming up this east-facing hill, they were obviously a lot more southerly in the air. Juan soared for a couple of minutes, then headed out to the LZ and made an excellent landing. Total airtime was probably 3 minutes, but he sure learned a lot in that time - and made some good decisions, too. We might head for La Luz tomorrow (light NW winds) and are considering Magdalena Rim on Thanksgiving Day. Let me know if you want to join us!